As we wrote to you earlier this year, Fort York Historic Site will be opening a Virtual Reality Exhibit to the public for the first time this season. To share in this exciting accomplishment, the Toronto ACM SIGGRAPH Chapter would like to invite you to join us at Fort York as we host Srinivas Krishna, founder and CEO of AWE Company. Srinivas has been at the helm of the technology development for this exhibit and will describe the challenges involved in creating a Virtual Reality experience for a National Historic Site. Srinivas’ AWE Company, Fort York Historic Site, and a group of partners have teamed up to transport visitors back in time to relive history through the power of VR. The exhibit allows guests to walk around the Fort equipped with a headset through which they peek into a reconstruction of the past. If time, weather, and technology permit, a few of our guests will experience a taste of the exhibit. Srinivas’ career in film, television and interactive digital media spans twenty-five years. His work as a digital media innovator has been applauded by Canada’s national newspaper, The Globe and Mail, as “utterly breathtaking… genius.” Drawing on his experience with site-specific media, Srinivas founded AWE Company Ltd. in 2012 to develop patent-pending technologies and tools that enable immersive, interactive, augmented and virtual reality experiences for mobile audiences – the cinema of the future. Prior to AWE, Srinivas has produced and sold feature films that have premiered at Toronto, Sundance and Cannes, and have been distributed worldwide. He launched his career in 1991 with the international hit Masala, which was voted by the British Film Institute among the Top Ten South Asian Diaspora Films of the 20th Century and is a classic of world cinema. 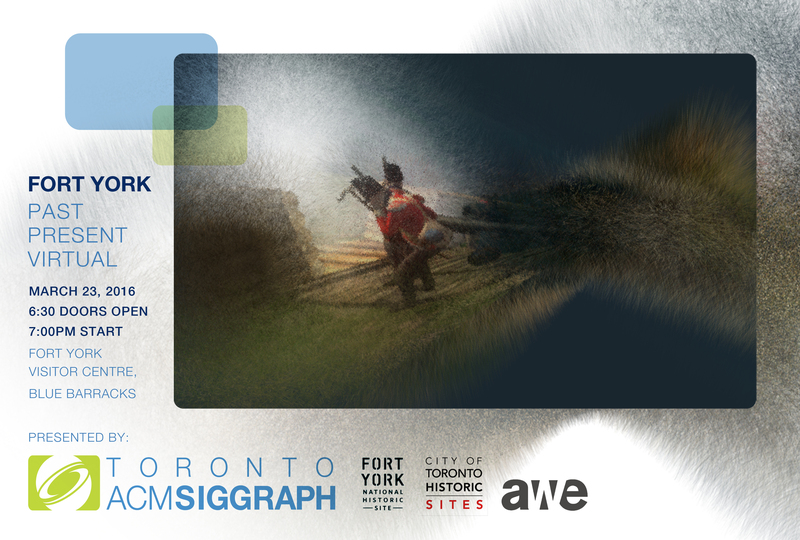 We look forward to hosting you at Fort York! Directions: We are meeting INSIDE the fort! Find the Officers’ Blue Barracks at #8 on this map. or purchase or renew your membership on Eventbrite and attend this event for free!